When you look at the Tracker Maine Group's roots and how they got started, their vast success should really come as no surprise. In 1978 Bass Pro Shops Johnny Morris introduced Bass Tracker, the first professionally rigged, "fish ready" boat for sale in the industry. He put the same enthusiasm into Bass Tracker as he did his Bass Pro Shops and together, have formed one of the strongest and reputable brands in fishing. But they wouldn't stop there. With family boating on the rise, Tracker needed something to fit in this market rather than the specialized Bass Tracker, so in 1983 Sun Tracker was launched. This new line of boat would build off the growing popularity of pontoon boats and would prove to be a popular way for parents and kids of all ages to get out on the water to fish safely. The late 80's were filled with new facilities opening up throughout Missouri, including a trailer manufacturing plant to be packaged with every new boat sold, a trend that's still happening today. 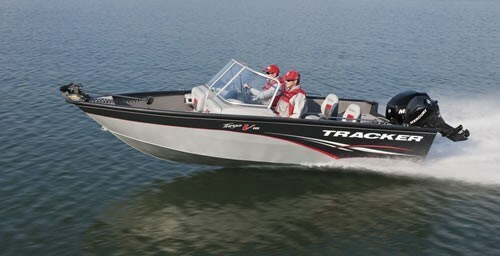 Tracker spend most of the 90's building on their already rock solid foundation of providing boats that come ready to fish, at an affordable price. They had grown from Bass and Sun Tracker, to add fiberglass boats and Nitro Performance fishing boats. 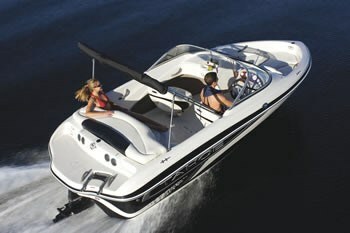 In 1998 they introduced Tahoe boats to the market. These fiberglass runabouts would also feature deckboats and fish-ski combinations. They would soon become one of the fastest growing boat lines in North America and one look at one and it's easy to see why. Value priced, Tahoe boats aim to make getting out on the water easy and affordable for all boaters. It's that kind of customer oriented thinking and dedication to build quality that has lead the Tracker Marine Group to the success they experience today. They continue to be one of the world's top boat manufacturers with value priced, quality used boats on the market. Their new and used fishing boat brands include Bass Tracker, Tracker, Sun Tracker, Tahoe, Mako, Kenner, Sea Craft and Myacht house boats.